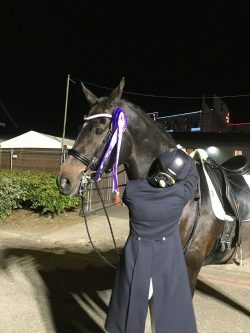 I was just on my way to teach a clinic when I got a phone call from British Dressage asking if I was busy the following night and would I like to compete at HOYS in the Future Elite Dressage Horse Championship!! With there only been a week before I travel to compete for GB in France my sensible head was saying no don’t go this could blow Detonators brain for months, he has a habit of living up to his name!! I have never been to HOYS but my trainer Becky Moody says the atmosphere is like nothing I’ll experience again. But fortunately the none sensible side of my head took over and I said yes I’ll do it!!!! I’m not sure how I managed to go and teach I was bubbling with nerves and excitement knowing as soon as I got home I had to get packed and head off to Birmingham. I was about to compete in front of thousands of people, against some of the top riders and top horses in the country on horses aimed at the Olympics, with absolutely no preparation, what was I doing!!! My friend and fellow competitor Natalie Widdowson dropped everything and agreed to come with me, she is a calming influence on me haha. We had a 4.5hr drive to get there arriving at 9pm, we settled him in his stable and went to have a quick look round. When I saw the main arena I nearly had kittens, all I had visions of was Detonator entering spinning round and galloping straight back out at 100 miles an hour!!! With this in mind I don’t think I slept that night. The following morning I managed to work him in the small indoor warm up and he was surprisingly chilled out considering all the show horses coming in and out of their classes. I then had chance to have a proper look around, do a spot of shopping and watch the showjumping and Carl Hester master class which made me even more nervous. I went back to check on him and found him stood in his stable shaking like a leaf, at first I though he was ill but then realised he had been scared stiff of the shire horses coming past with all their gear on. I was starting to seriously worry now that I had done the wrong thing bringing him. At 5.20 we had chance to go and do a sound check in the main arena and work them a bit, as expected he was like a cat on hot bricks but as I worked him he did start to settle a bit. I had had an unbelievable amount of support and messages from people on Facebook and as I came back out into the warm up I decided whatever happened in there that it was amazing that I had been asked to compete and I will never get to do this again, I as determined just to go and enjoy the moment. As I waited in the tunnel behind the curtains I took a deep breath, told myself not to look into the crowd or let him look, smile and bloody enjoy it. The curtains opened and off we went, he was a bit spooked at the people in the hospitality at the bottom end but very surprisingly he started to settle. The bell went, I smiled and off we went down the centre line to our lovely music designed by Equivisions. I could not believe he was actually behaving and felt fairly good, I was in hind sight not daring enough and didn’t push for the extended’s as I was bothered he would explode, he produced a correct mistake free test and I really could not believe it. As we halted at the end I was so emotional, I could not have asked anymore of my special horse. I came out in tear of joy back to the quietness of the collecting ring. Went I bought him as a newly broken 3yr old I never in my wildest dreams though I would end up competing at something like that in that company, it really is like living a dream at the moment with this horse. I was even more ecstatic when we scored a PB of 69.32% we had held our own against the elite, with only 24hrs preparation!!! I managed to pop back to watch Charlotte Dujardin ride her winning test and some of the others, it was then the lap of honour, we were first in and loved our moment trotting round to huge applause from the crowd!! Next stop is Le Mans in France competing for GB again but our first time abroad, if I even manage to get there I’ll be impressed, I’m not looking forwards to driving on the wrong side of the road!! !